After twenty five years I have just re-read Voltaire’s most famous work, “Candide, ou l’Optimisme” and that’s a lot of time not to read it. Not least when you understood so little the first time. Of course, my French today is such that reading it now is a breeze, and from a simply aesthetic point of view Voltaire’s use of the passé simple is a joy. I have noted myself as a curmudgeon, a misthanrope and a cynic, so it is perhaps inevitable that Voltaire’s final rejection of a macro-world pleases me so much. I have never understood why it has to be regarded as negative. Surely a micro-approach to life starting with one’s own, or one’s own entourage’s pursuit of happiness and fulfillment is to be lauded? And certainly today, in a very definite sense, it is difficult to scan the broadsheets or zap though the news channels without agreeing generally that the world is a terrible place. Israel-Gaza, Ukraine, Syria, climate change, pestilence and plague…How can this really be, “le meilleur de touts les mondes possible”? Rather look after and protect one’s own little world. Where is the negative in that? In any event, Candide is a great little read. It is extremely funny, extremely anglophile in its ferocious irony and his “piques” and jibes at national traits, be they French, English or any other remain apposite today. It doesn’t take long to read, it’s replete with gags and gives a certain succour to my own points of view. What more could you want? 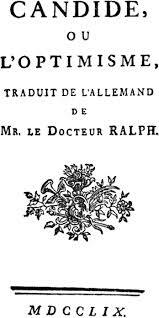 I suppose for balance I should really now dig into Rousseau, but I have always found that idea intimidating. Maybe next week. Here is a link to the podcast on Candide on Melvyn Bragg’s “In Our Time” programme. I can’t remember what my translated copy was like, so if you can, read it in French. This entry was posted in VF - Pour encourager les autres and tagged Candide, In Our Time, Leibnitz, Melvyn Bragg, Voltaire. Bookmark the permalink.